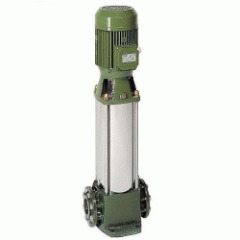 Compact multistage vertical electric pumps, suitable for lifting installations with or without autoclaves, fire-fighting installations, irrigation systems and wherever elevated pressures are required. X5CrNi1810 stainless steel pump pipe. AISI 431 stainless steel shaft. Mechanical seal: sliding faces in hard metal, seals in ethylene propylene rubber. Stainless steel sleeves with ceramic lining. Maximum temperature of liquid 120°C. Max. operating pressure 25 bar. In-line connectors, available on request, can be coupled to counter flanges.